I've had this idea for this Halloween costume for a few years now but finally had the chance to write up the pattern. Introducing the quick and easy Baby Candy Corn Halloween costume! You can totally whip up this adorable costume in just a few hours. 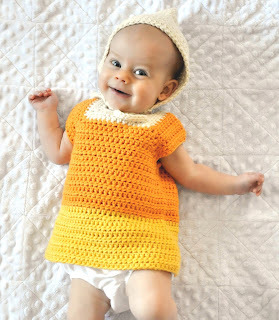 With a long sleeve onesie and tights, this will keep your baby nice and warm when out and about on Halloween. Enjoy! Gauge: 15 hdc and 13 rows is a 4 inch square. 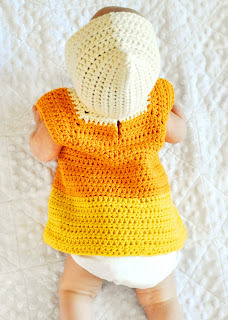 Sizing: Sample made fits a 16 inch chest, 0-3 month old baby. To size up or down, adjust hook size and/or yarn thickness. With white yarn, ch 40. Your work should look like this more or less after the first row. Row 3: Ch 1, turn, [1 hdc in each st to pm, (hdc, ch 1, hdc) in ch space] 4 times, 1 hdc in each st to end of row. (56 hdc) Join orange yarn. Note: You will now begin joining at the end of the round. Round 17-20: Ch 1, turn, 1 hdc in each st around, sl st to first hdc of round to join. (70 hdc) Join yellow yarn. Finishing Dress: Fasten off and weave in all your ends. Attach a button at the yoke opening. Block piece as desired. Note: Sample hat was too small for the baby (see how it doesn't quite make it to the forehead?) My original pattern called for 15 rows, but I've increased that to 20 rows. Rows 2-20: Ch 1, turn, 1 hdc in each st to end of row. (40 hdc) Do not fasten. Finishing Hat: Fold your work in half so the short ends are lined up and sew up the long end by working 1 sc through both thicknesses up to the fold. To make ties, join yarn at one of the corners, ch 21, turn, sl st in each ch back up to the corner. Fasten off and weave in all your ends. Thank you so much to the lovely and talented Pam Dajczak for taking these fab pictures. Pam is a very talented designer with tons of fantastic patterns, so I encourage you to check out blog and her shop and pick up a few of her patterns! Thank you for the adorable pattern! Have you, or anyone else, substituted single foundation chain 40 for the regular chain 40 at the beginning of the pattern? Did it affect the button hole? Thanks for your help! 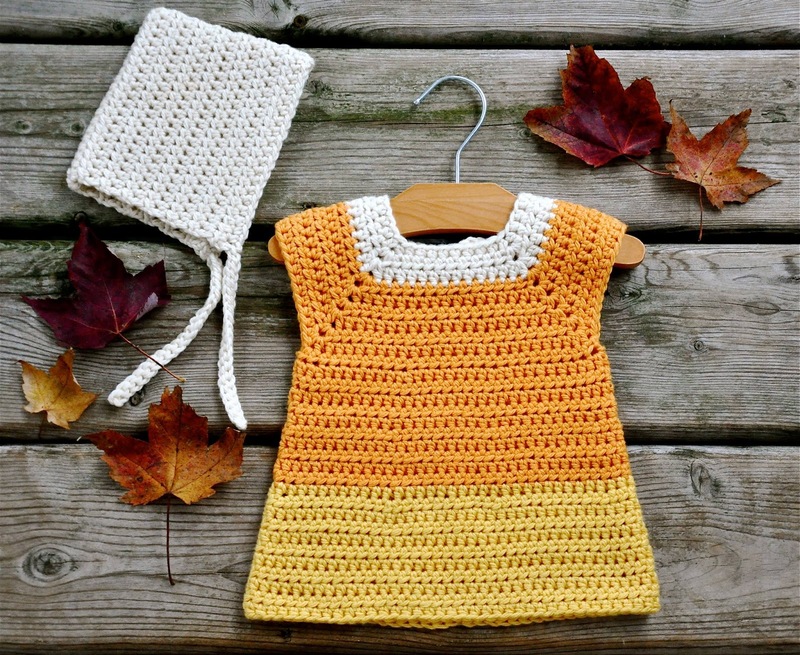 I'm making this for a 6months but I need to figure it out for a Size 4T. I don't know how to adjust it! I love this easy pattern. So cute! I'd use a larger hook and thicker yarn and then make sure the neck hole is big enough. Keep doing the yoke rounds until the chest measurement is what you need it to be. Good luck!